Home and Gardening With Liz: Forsythia a Sign of Spring! I know a lot of you have already had your spring blossoms but we're just getting started here! I loaded up my big vase with these forsythia branches. I used some chicken wire in the bottom to help get them standing the way I wanted. I had to lace the branches through the chandelier. I love seeing this cheerful display on the table! No sooner had I showed my mantel change a little while back and I made one more change. I substituted the large ginger jar with the large white lantern that I've used here before. 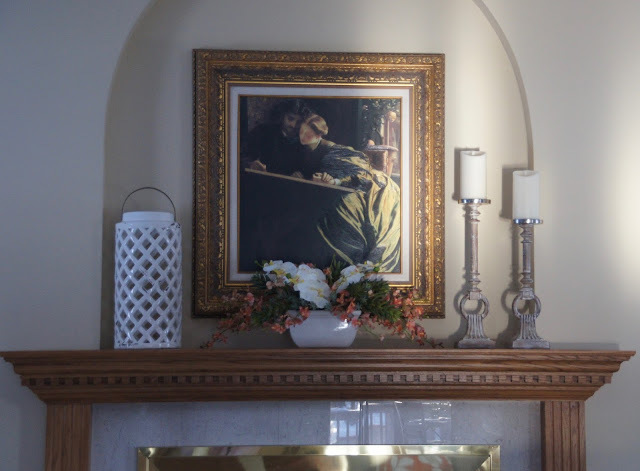 I try not to get too formal on the mantel with my decorating but with that portrait it is easy to head that direction. When I found this portrait I did some researched about it on line. 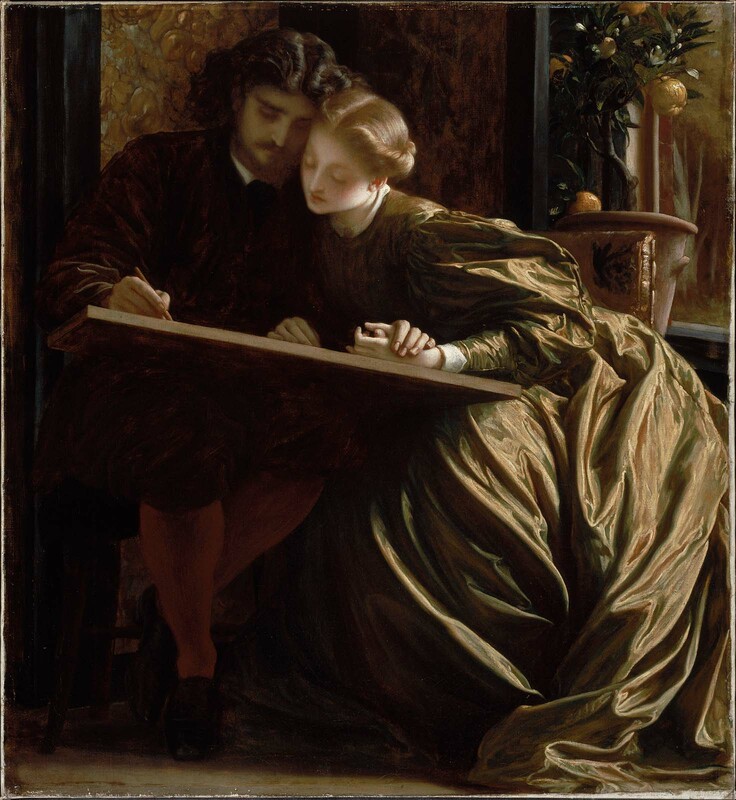 It's titled "The Painter's Honeymoon" by Lord Frederic Leighton, 1864. The real one is at the Museum of Fine Arts in Boston. I've ordered curtains and new rods. I've gone full circle on that subject. All I'm going to say is that fabric has become outrageous these days. Hopefully I'll like them and will show you soon! I love how you have your forsythias arranged, Liz! So elegant looking entwined in your chandelier! 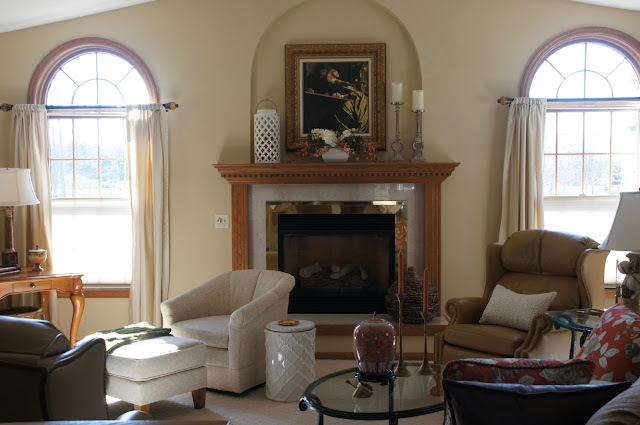 I always love how you re-arrange your furniture for the seasons and am looking forward to seeing your new curtains and rods! And yes, fabric prices have become outrageous! I use to make a few clothes each year, but it's so much cheaper to buy ready-made! I've finally been able to enjoy the warmer weather we're having and get outdoors so my crafting is on the back burner for now. Hope you are enjoying warmer weather, too! Liz, the forsythia is gorgeous running through your chandelier. Our forsythia bloomed in late February and early March. I can’t wait to see your new curtains, I know they will be lovely! I know you are excited to have nicer weather! 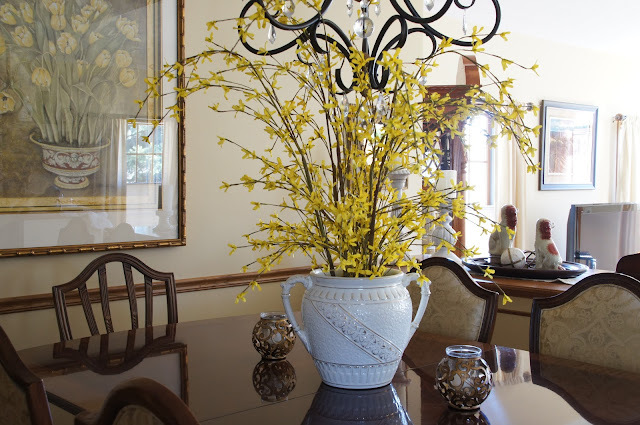 Wow how beautiful the forsythia looks on your table. Just so pretty. Happy Tuesday Liz. Have a great rest of the week. Yeah for Spring to finally be here for us in the midwest! The forsythia is gorgeous Liz! 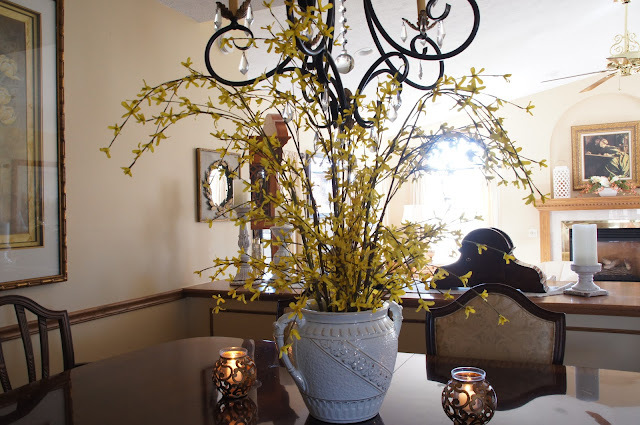 My forsythia had bloomed and then the late freeze got to them...What a beautiful showing of Spring in your home...and I too love that painting! Cannot wait to see your new curtains! I love forsythia. I need some for a vase soon. 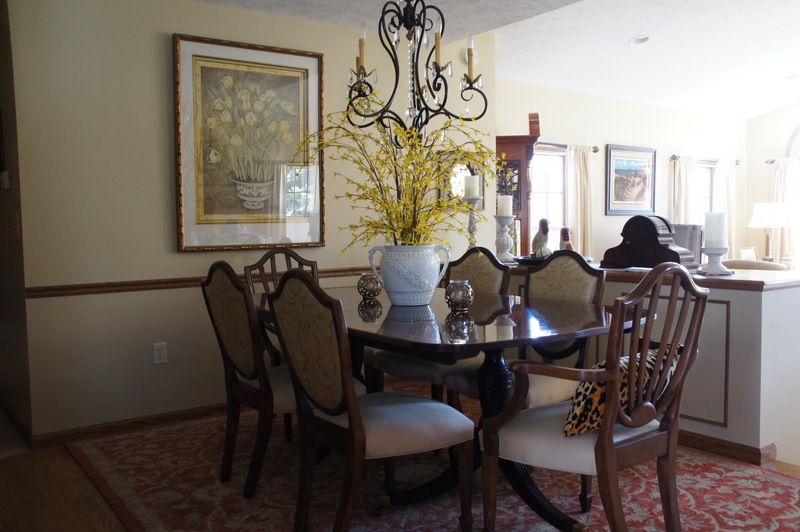 Liz, your Forsythia branches are gorgeous! I cut mine way back last fall and it wasn't as pretty as usual. One of the first signs of spring for me. Thanks for sharing with SYC.